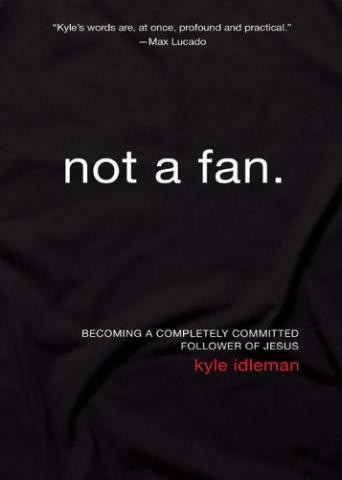 Idleman writes one of the most serious books about what it means to follow Christ I think I’ve ever read. In fact, much like Jesus, the author doesn’t pull his punches and cuts to the heart of the matter. In following Christ, there are no “halfways”, “most of the times”, or “excepts”. It’s all or nothing. The subject matter is so intense in Not a Fan that Idleman has to put some comic relief in the footnotes. The first time I checked the footnotes, I thought, “This is inappropriate. It’s serious stuff here.” By the end of the book, I was praying for a funny footnote so I wouldn’t be crushed by the weight of conviction steeped in the message of the book. And Jesus had some funny lines that helped alleviate the tension of His message too. Just try to picture a camel going through the eye of a needle one time. I have never read a book I would recommend so much as this one. If you’re a fan of Jesus, get this book, and find out what a follower looks like. Love the concept of that book. Jesus definitely expects us to be dedicated not "friended!" Thanks for the tip.. I'm ordering the book today..
i really don't take too much time analyzing what a follower of Christ should be. i believe that it's just easy. i dont think i am a fan nor a follower. i view my self as a lover of Jesus.